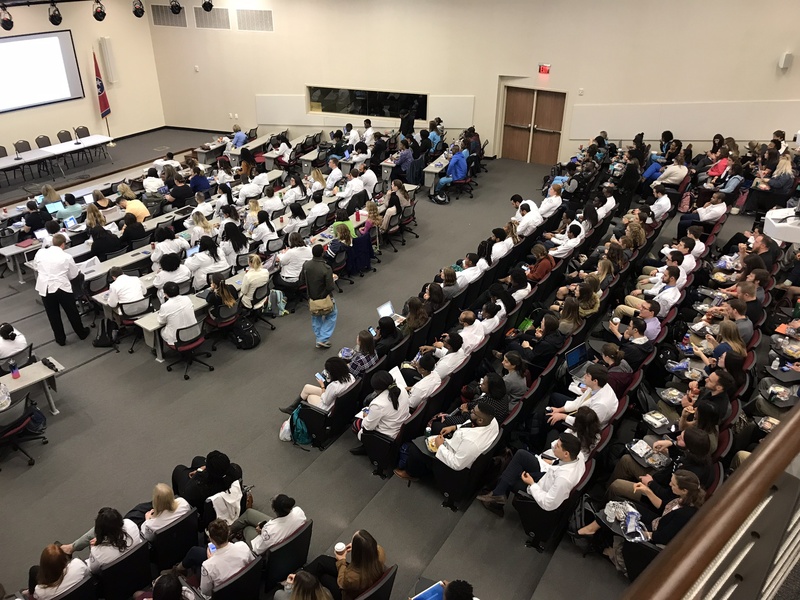 Students from the Physical Therapy, Occupational Therapy and Pharmacy programs at Belmont University joined forces for the Geriatric Interprofessional Team Training at MeHarry Medical College on February 16. This training session, held yearly, offers an opportunity for participants to collaborate with students from other universities and different disciplines in the health care arena to offer the best treatment plan for a patient in a case study. It allows students to learn about other disciplines and how their work helps the overall patient care team. More than 450 students from universities across the State of Tennessee participated. In total there were 67 Belmont pharmacy students, and 5 Belmont therapy students in attendance. This was the first time that this interprofessional group included the occupational therapy profession, providing students with a unique experience they hadn’t had before. Belmont faculty leading the charge were Natalie Michaels from PT and OT, and Angela Clauson, Cathy Ficzere, Ashton Beggs and the Dean David Gregory from Pharmacy.